Looking for Custom Hat Channel? We at MetalsCut4U are here to fulfill your requirement with your desired choice of sheet metal. Here you can configure a Steel Hat Channel, Aluminum Hat Channel, Stainless steel Hat channel, just by going walking through a easy 4 step configuration process. How to configure your custom fabricated metal hat channel online? you already have fulfilled 3 out of the 4 easy steps to configure your sheet metal hat channel. In the 4 step you choose the hat channel to be configured. Enter your individual measurements and click on calculate. Enter your measurements either in decimal or fractions. 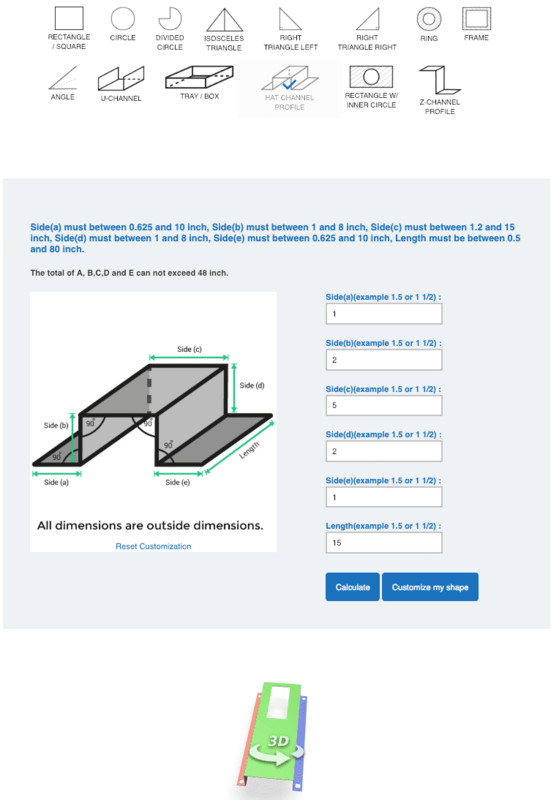 The sheet metal calculator will give you a price for your custom cut metal hat channel including the options you have chosen. Add them to the shopping cart and either continue to configure the next sheet metal part you need or go to the shopping cart and enter your address and the preferred payment method to order your custom cut sheet metal. What is Hat Channel and why to get a Custom Hat Channel from MetalsCut4U? This furring channel is often referred to as "Hat" channel due to its shape. 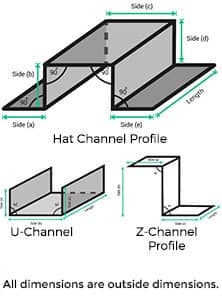 While you can buy standard sized hat channels almost anywhere you can determine the exact size of each side describing the Hat shape within our 4 step process. Hat Channels are often used in framing components used for ceilings and masonry walls. It is used for noncombustible furring for interior and exterior walls and also used to level uneven surfaces on the wall. Based on your measurements we will fabricate the Hat channel you require. Every length can be determined by you depending on your specifications. We take your measurements and program our laser cutter to cut and bend the hat channel you need. Cutting and bending your hat channel will be extremely precise. Configure the Hat channel you need and get it delivered to your doorstep. It’s that easy.